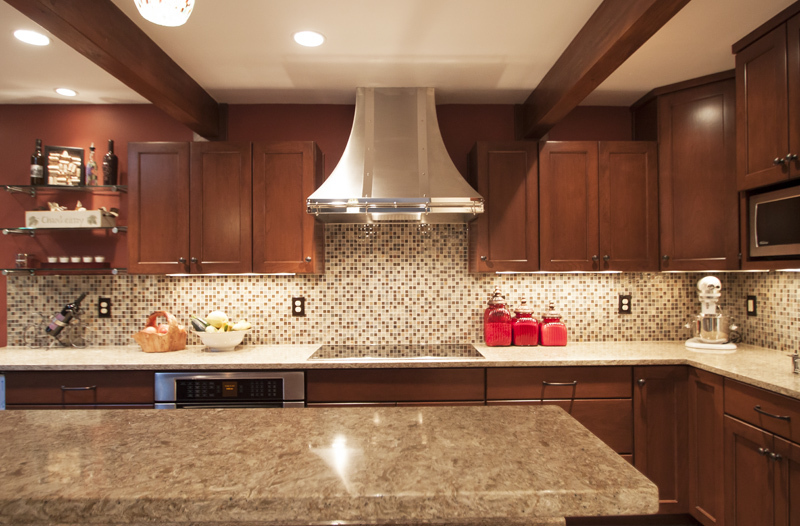 Warm and pleasant: Cambria Berkeley Dark Cabinets Backsplash Ideas. The combination of beige and beige movements is speckled by charcoal like poppy seeds, burgundy, and golden. Another doable dark cabinet backsplash ideas in kitchen remodeling is waiting for you. Polished or honed quartz stone countertop can be used. In Cambria Berkeley Dark Cabinets Backsplash ideas, some fine movements on the backsplash will be emphasized. Usually playing with different tile set up , and picking some matchstick or mosaic combination into solid tiles are good tricks. In both conditions, your elegant engineered stone countertop will pop up automatically. In Cambria Berkeley Dark Cabinets Backsplash ideas, usually subway tiles, glass matchstick tiles, mosaic tiles, and glass pencil tiles are playing a strong role. Let me give first the material and the characteristics of the backsplash then, the color and stain of the dark cabinets will be defined under each picture. Lemon Poppy Seed Bread: Cambria Berkeley Countertop article has some extra pictures for your backsplash ideas. The backsplash colors for Cambria Berkeley Dark Cabinets Backsplash Ideas can be same as the Cambria Berkeley White Cabinets Backsplash Ideas. The material for the backsplash can be glossy ceramic, glass and travertine. The type of the backsplash tile would be subway, mini subway, matchstick or mosaic. Let me introduce Cambria Berkeley Dark Cabinet Backsplash Ideas by sharing my favorite pictures. Picture Credit: Cameo Kitchens Inc., Cambria Berkeley Countertop and Island Top are in a modern transitional kitchen design. Cherry cabinets with Traditional Finish and Brixton Piano Tessera Mosaic Glass and Stone Backsplash ,Chimney Style stainless steel vent hood and Benjamin Moore Navajo Red 2171-10 wall painting are on the good hands. Endearing…. Picture Credit: Estate Cabinets., Maple cabinets with Auburn Glaze, Polished Cambira’s Berkeley countertop and island top are embellished with hand made backsplash tile. Tile set up is a mixture of diagonal set up and framed square set up. I adore the the harmony between flooring ( the info will find you soon ) and cabinets. Fine taste in kitchen remodeling. Picture Credit: Julie Piesz Interiors, Inc. via Houzz, Matte Brown with black glazed maple cabinets and Mannington- Adura AT281 Tortilla porcelain flooring are the best choice to pop up the overhang breakfast bar and perimeter countertop. Backsplash is just what I was thinking to suggest to my curious readers; Combination of diagonal set up and square brick set up ceramic tiles divided by a mosaic tiles . Pratt & Larson- Color W81 diagonal and square backsplash is trimmed by Sonoma Tile Tantrum Glass- Earth & River. All the colors are fluttering in this kitchen coherently. Picture Credit: Blue River Cabinetry., The pleasant feelings surround you. Cambria Berkeley quartz countertop , Bedrosians Morningside linear mosaic backsplash, cherry paprika cabinets with chocolate glaze and DalTile Travatta in Toasted Almond flooring dance amazingly. Picture Credit: Naylor’s Kitchen and Bath., Cambria Berkeley Perimeter Countertop with overhang breakfast bar is the good match with Cherry Russett Cabinets. Light cream porcelain flooring is coordinated with the field tile ( Tailormade Series) and glass mosaic tile liner. Split level wall cabinets and efficient use of corner sink and faucet with a shelf show that some keen eyes stare this kitchen. Please keep this article fresh by dropping a comment about Cambria Berkeley Dark Cabinets Backsplash Ideas. Thank you for collaborative work and thank you for being my dedicated reader.